The title pretty much says it all, and frankly, how is this possible in 2007 is beyond me. But wait, isn’t it 2009 (almost 2010?). Yes it is. An therein lies the rub. I wrote this two years ago, and the fact that most of it is still valid is quite sad. Fax technology should be dead – it’s ridiculously unpractical to translate meaningful text to dumb image, when on the receiving end they need meaningful text again. Yet in many professions faxes are still used, and from time to time all of us are forced to dealing with it. That means finding a service appropriate for the ad-hoc, just-in-case use, nothing less, nothing more. What’s wrong here? There’s not a single offer tailored for individual ad-hoc users. I’m sure a busy office has enough fax traffic to justify the $10 or so that most of these services charge, but as a consumer, the grand total of faxes I receive in a year is perhaps 2-3, and I don’t send more than 5 per year. $10 is not a huge amount, but why would I pay a monthly subscription optimized for 1-200 pages monthly traffic? The free version of eFax (btw, how could the granddaddy of Internet fax services escape the comparison?) allows free inbound services, but no sending at all. I don’t expect free sending, but why can’t I pay per use, only for the pages I send? Oh, well, since the previous (2007) vintage of this post, I’ve found two free / pay-per-fax services that solve the outbound problem: FaxZero and GotFreeFax. Very well – problem solved. Except now there’s trouble on the inbound front. In the past two years two of my eFax numbers “disappeared”, and so did an alternative one @ FaxDigits (in fact FaxDigits no longer seems to exist). For now, any time I need to give my fax number to someone, I need to send a test fax to it first to check if it’s still operational. That’s crap. Yes, I get what I pay for, you might say – which is zero. But like I said, I’m willing to pay, just not $10 per month – that would make the 2-3 faxes I receive par year really expensive. I can’t believe I am the only one with such usage pattern and there is no reliable provider with a usage-based pricing plan to match such usage. OneSuite has a solid and very usable fax-only option that is dirt cheap. There actually IS a pay as you go fax service–PayPerFax.com! We review it here: http://www.faxcompare.com/internet-fax-reviews#payperfax. 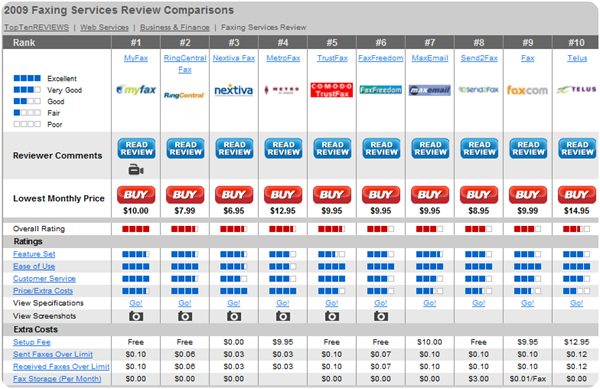 Also TopTenReviews, while good, is not the only comparison site that shows valuable information. I represent FaxCompare.com, which shows a much more comprehensive list of all of the major internet fax providers offering services. Check it out! Dr. Cheap is right. Onesuite.com has a fax service that’s really cheap its almost free. Onesuite has $1/month unlimited incoiming fax service. So whether you get 1 or 1000 faxes a month, you still just pay $1 monthly. If you need to send out one out too then the fax plus service is $2.95/month, again all incoming fax are free. Outbound per page rates depends on where you send your fax. It’s 2.5c to US numbers and 1.9c to Canada. Different rates to other countries but usually its under 3 cents per page. Simple! My only hope is Google, Yahoo, or some other behemoth will enter this space and fill the void for existing customers. Been looking for a good pay-per-use fax service for a loooong time. Found PamFax on this (http://www.squidoo.com/fax_online) page and it looks like a winner. Tried the free 3 page fax before I signed up for some credits. The Windows client worked really nicely with one small glitch. OK for me, but I’ll need to solve it if I’m going to get my wife to use it. I’ve used a lot of the other services, eFax, FaxZero, and another one a few years ago. This one looks promising (fingers crossed). http://www.PamFax.biz is the way to go. Save your time on searching – I had to deep-dive on Internet to find what I’ve been looking for. LowFax.com is a true pay as you go worldwide outgoing fax site. The site is very simple to use, and rates are very cheap. You don’t need a subscription or any downloaded software. It’s all run off the website. The services offered in the original article don’t use a secure server. I found payperfax which requires a login and operates on a secure server. There is a nominal charge, but .75 for the first page and .40 for subsequent pages is a good deal. Most of my faxes are usually to a government office or college and just a couple of pages.